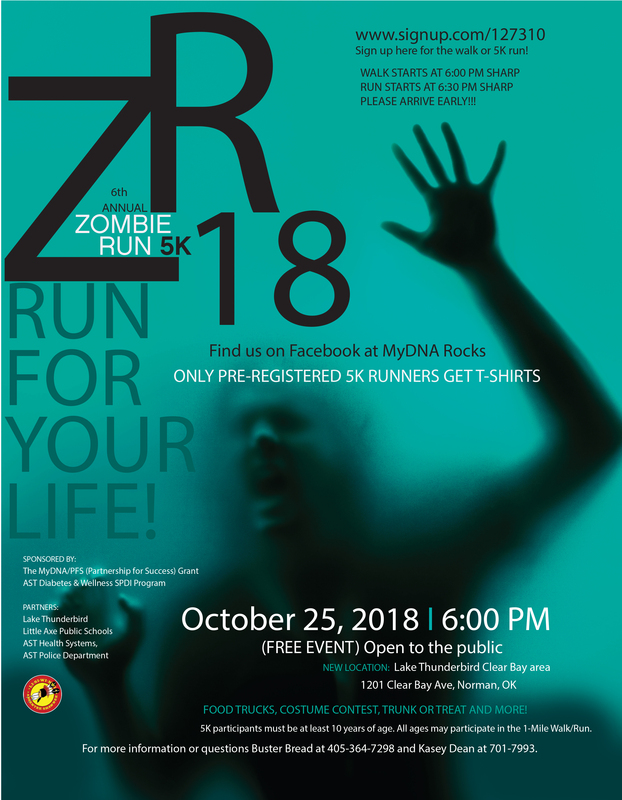 Come join us for the 6th annual Run For Your Life Zombie Run 5K! It will be at the Thunderbird Lake Clear Bay area Thursday evening, October 25th at 6:00 P.M sharp. Be sure to arrive early so you can visit the food trucks, have fun at the costume contest, and visit the trunk or treat. 5K runners who pre-register will recieve a t-shirt. 5K participants must be at least 10 years of age and all ages may particiapte in the 1-mile walk/run. This is a MyDNA Partnerships for Success and AST Diabetes and Wellness SDPI event. If you would like regsitration information or if you have other questions, please call Buster Bread at (405)364-7298 or Kasey Dean at (405)701-7993.